“In Wenger we rust…” As the pressure mounts on long time manager Arsene Wenger, this is the phrase coined by a contingent of the Arsenal faithful. The Gunners have endured a relatively poor campaign in the Premier League this season as well as two premature and embarrassing exits from the domestic cup competitions. Arsenal were dumped out of the FA Cup at the weekend by Blackburn Rovers in a 0-1 defeat, but also lost on penalties against League Two Bradford City in the quarter final of the League Cup to add to the fans frustrations. 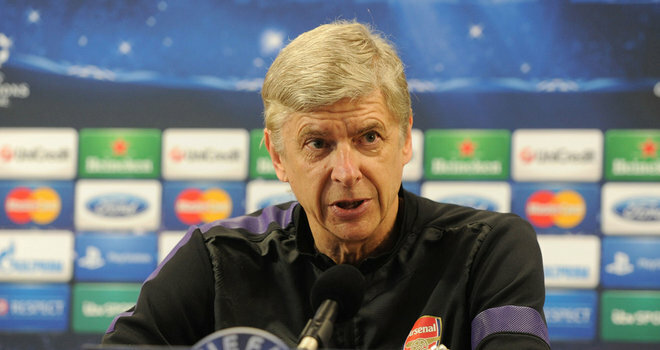 The mounting pressure and frustration came to a head on Monday as Wenger exploded in front of the cameras at the pre-match press conference for Arsenals last sixteen Champions League tie against Bayern Munich. The Frenchman vented his anger at the journalists and media officials present in an uncharacteristic display, devoid of any calmness or composure. Questions over a new contract and cup exits were met with a hostile response from Wenger as he questioned the level of respect shown towards him and quoted the number of FA Cups he has won with The Gunners. But overall, it was a shock to see the normally calm and collected figure go on such an aggressive tirade in front of the cameras. Arsenals continuing failures seem to be taking their toll. The Champions League is Arsenals last chance for silverware this season and some would argue, Wenger’s last opportunity for redemption in the eyes of the Arsenal faithful. A very strong Bayern side stood in the way of Wenger and his men. Bayern have only conceded one goal in the Bundesliga this season and are running away with the title at the minute, last year’s runners up are proving to be one of Europe’s best once again. Injuries had eaten away at the Jupp Heynckes options at the back as Jerome Boateng and Holger Badstuber were still missing from the line up whilst Arjen Robben and Mario Gomez only made the bench. However, Bayern’s starting eleven was still a strong one, boasting many household names including Frank Ribery, Thomas Mueller, Bastian Schweinsteiger, Phillip Lahm and Manuel Neuer. Arsenal started with arguably their strongest line up, deploying Theo Walcott upfront, supported by Lukas Podolski and the interchangeable Arsenal midfielders, Santi Cazorla, Jack Wilshere and Mikel Arteta. Thomas Vermaelen was deployed at left back in the absence of Nacho Monreal and Aaron Ramsey came into the midfield. Although Arsenal started the better side, Bayern took hold of the game spreading the ball out wide as the overlapping full backs looked to deliver crosses from the wings. Toni Kroos broke the deadlock after only seven minutes of play as his right foot connected with Phillip Lahm’s cross on the edge of the box to make it 0-1. Bayern’s pressure continued to cause the Arsenal defence problems, which were only exacerbated by Per Mertesacker’s poor distribution of the ball from the back. The German side then doubled their lead on 21 minutes from a Toni Kroos corner, Thomas Mueller found himself unmarked in the six yard box to poke home Daniel Van Buyten’s near post flick on. Once again the poor execution of the zonal marking system was Arsenals downfall as not a single defender attacked the ball. The Gunners managed to hold out and went into the half time interval at a two goal disadvantage and what seemed like an impossible task to recover. Wenger resisted making any huge changes at half time and sent the same side back out for the start of the second half. Arsenal began to get a foothold in the game as they kept the ball well and pressured Bayern when they were in possession; The Gunners were eventually rewarded for their persistence. A Santi Cazorla shot was deflected out of play for what should have been a goal kick but a corner was awarded. The inswinging corner taken by Jack Wilshere was missed by everyone in the penalty spot melee as Manuel Neuer got caught in no man’s land and none of the Bayern defenders got their head on the ball. Lukas Podolski was on hand to head the ball into an empty net and reduce the deficit to 1-2 on 55 minutes. Arsenal continued to press the ball well and sensed a way back into the game. Wenger made a couple of substitutions to freshen things up as Thomas Rosicky and Olivier Giroud replaced Aaron Ramsey and Lukas Podolski. Giroud almost made an instant impact as a smart run to meet Walcott’s low cross was followed by a powerful shot which was saved well by Neuer. But any hopes The Gunners had of levelling the scores quickly evaporated as Mario Mandzukic got a bit luck to finish off a great move from Bayern. The long pass from the back was well brought down by substitute Mario Gomez who laid the ball off to fellow sub Arjen Robben, the Dutch winger controlled well and slid the ball down the line into the path of the overlapping Phillip Lahm. The defender remained composed and fired the ball through the corridor of uncertainty between the Arsenal defence and goalkeeper. Mandzukic made it 1-3 at the Emirates and Arsenals task is all but impossible. The chorus of boos that followed the final whistle were not as loud and overwhelming as they were after Saturday’s FA Cup exit but the frustration continues to mount amongst the fans. Arsenal were thoroughly outclassed by Bayern on the night and didn’t do enough to merit taking anything from the game. It will be an incredibly tough task for The Gunners to overturn the two goal deficit at the Allianz Arena in Munich. Although the task is not impossible, the quality of the current Bayern side should have no trouble completing the job on home turf. Jack Wilshere was the one shining light for Arsenal as the young, England midfielder ran himself into the ground for his team. Constantly seeking the ball and committing the opposition, Wilshere showed the desire and determination to grab the game by the scruff of the neck and haul his team back into the match. Arsenal fans continue to call for Wenger’s head as The Gunners trophy-less spell looks set to continue. Basic defensive mistakes, slow starts and sloppy play have really cost Arsenal this season and Wenger must address several key issues within his squad if they are to be the force they once were, both domestically and in Europe. There is a clear lack of a world class forward, a strong defensive midfielder and an out-and-out winger within their ranks. It has been left up to young players such as Jack Wilshere to drive the squad forward and the England man could once again be at the risk of burnout and injury if overplayed. The rebuilding project at Arsenal is still missing some key elements and a contingent of the Arsenal fan base are questioning whether Wenger is the right man to lead The Gunners forward. In my opinion, Wenger has had a tough time over the past few seasons; the selling of key players such as Cecs Fabregas and Samir Nasri with no marquee replacements, the reliance on young players, poor performances on the pitch and the rule of the board seeming to override the manager have all contributed to the building pressure and discontent against the Frenchman. However, my feeling is that Wenger can be successful again with The Gunners and if the rumours of a summer transfer kitty of £70 million are true then Wenger will finally have the resources required to complete the rebuild of his squad, plus it will be very interesting to see how he spends such a hefty sum of cash in the transfer window. His managerial credentials are second to none and he would be a big loss to English football should he leave Arsenal. Maybe Arsenal fans just need to lower their expectations a bit. They aren’t the wealthiest club in the country, or even the city. Money talks in the Premier League and Arsenal need to set realistic goals like winning the Eufa Cup. Thanks for the comment! Agreed Arsenal are no Man City or Chelsea, but if the reports of £120 million of summer transfer funds are true then they need to get spending or risk going the same way as Liverpool in recent years. Plus, as a business, I think Arsenal are much better placed than most Premier League sides at the minute. They will be self sustaining once the stadium debt is paid off.